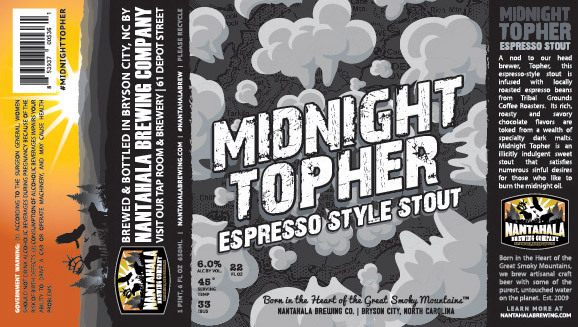 (BRYSON CITY, NC) – On Black Friday, Nantahala Brewing Company will release 22 ounce bottles of its next specialty beer, Midnight Topher, a stout infused with locally produced Tribal Grounds Coffee Roasters espresso beans. Created by Head Brewer Chris White, this espresso-style stout was inspired by White’s past work and his present career. Prior to becoming a brewer, White worked for numerous years as a barista. He greatly enjoyed the hands on nature of the job and the variety of flavors available in different roasts and bean origins. As a brewer he enjoys the same benefits as a barista, a hands on job that allows him to work with raw ingredients that are skillfully combined to create a delicious product. In his new work, he also enjoys the opportunity to get creative and design recipes, including Midnight Topher. Midnight Topher, deemed by Nantahala Brewing as an “illicitly indulgent stout,” is a 6% ABV stout infused with whole espresso beans after fermentation but prior to carbonation. This technique results in a beer dominated by iced coffee, roast and chocolate flavors without any of the astringency that can result from brewed coffee added to the boil. An addition of lactose rounds out the stout’s mouthfeel. And for the name? Midnight Topher wasn’t just created by White, it also got its name from him as well. Known as Topher around the brewery, White is known to partake in a bit of debauchery and sometimes likes to burn more than just the midnight oil. Bottles of Midnight Topher will be released at the Bryson City brewery on Friday, November 25th. The beer will also be available on shelves in grocery stores and bottle shops in Tennessee and Western North Carolina in the following weeks.